A step-by-step guide to getting all the achievements in the game New York Mysteries: The Lantern of Souls Collector's Edition, including the bonus material which unlocks after the first playthrough of the main game. SIX achievements unlock at the end of the game, however, you need to start earning them from the very beginning of the game. You need to play through the entire game keeping them all in mind in order for them to unlock. Completed the main chapter on Hard difficulty. Completed the main and bonus chapters without skipping any dialogue or videos. In all game modes (easy, medium, hard) it is possible to skip the mini-games after an amount of time. Avoid skipping any of the mini-games. The first three mini-games you don't skip will unlock Witty. You will need to exercise extreme restraint and not skip ANY of the mini-games in both the main AND bonus chapter to unlock the Puzzle Lover achievement. Completed 3 mini-games in a row without using a Skip. Completed the main and bonus chapters without skipping the mini-games. The hidden-object puzzles require you to find certain objects and combine them with other moveable or fixed objects in the area. (Note: there are no collectables in HO puzzles). There is a hint button in these puzzles which you must not press AT ALL in order to unlock Stubborn. This achievement only unlocks after playing both the main and bonus chapters. Completed the main and bonus chapters without using any Hints in the HO scenes. If you play through the main game AND the bonus chapter without using the hint button you will unlock Messiah of Light. Completed the main and bonus chapters without using any Hints. There are FIVE achievements related to specific mini-games in the main chapter and two achievements with time limits for mini-games. Don't worry if you don't get these achievements during the first playthrough. Once you've played the game through once, these mini-games become available in the EXTRAS menu where you can replay them over and over until you get the achievement. Completed the symbols mini-game in the living-room with no unnecessary taps. In Chapter 1: The Mansion Entrance, in the living-room, the first mini-game is a stone dial. If you make no mis-clicks you will unlock Erudite. Click on pairs of symbols from the outer circles to make the central main symbol. Completed the mini-game with the soldier in the Study with no mistakes. In Chapter 3: The Bunker Entrance, in the study, there is a soldier mini-game. If you send the soldier along the correct path you will unlock Strategist. Click on the green arrows that appear at each intersection as the soldier progresses. Completed the mini-game with tea cups in the Buffet without using the Skip button. In Chapter 5: The Opera Entrance, in the buffet, there is a tea cups mini-game. As long as you don't press skip (the button with a house on it) you will unlock Tea Ceremony. Drag and drop each of the overlays from the left onto the cups. The cups will automatically disappear. These achievements can be unlocked from any mini-game either during a playthrough or via the EXTRAS menu after the first complete playthrough. Complete a mini-game in more than 5 minutes. There are six achievements related to collectable items in the game. The collectables are only found in the main chapter. There are no collectables in the bonus chapter. If you miss any collectables on your first play through, the EXTRAS menu shows you all locations so you can go back to find what you missed. If you do go back, however, there is no indication of which location contains the missing collectable. Completed the Violin Keys collection. There is ONE achievement related to the hidden-object games and it involves a time limit. You must complete a hidden object game in under two minutes to unlock Supersonic. In my opinion, this is the only troublesome achievement to get - if you don't manage it during the first playthrough, you'll need to start an entirely new game to see the hidden object scenes again. If this is the last achievement you're hunting, I recommend switching to Easy mode, which will put highlights on all objects. This tactic worked for me and I got the achievement on the second HO game in Chapter 1. Completed an HO scene in under 2 minutes. There are TWO achievements available via the Extras Menu after you complete the main chapter. You do NOT need to have completed the bonus chapter to have access to the Extras menu. Collected all additional puzzles in the Extras Menu. 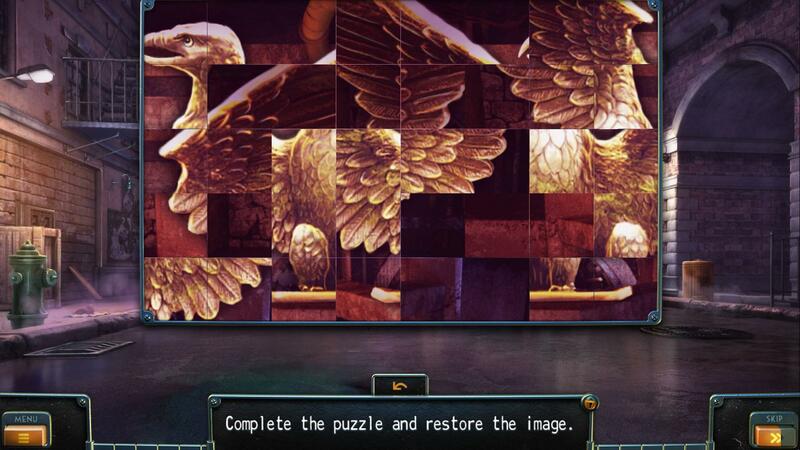 There are five Tile puzzles to complete under the heading Puzzles. Click on two tiles to make them swap places. Tiles do not need to be adjacent to one another. Completed all mini-game levels in the Extras Menu. 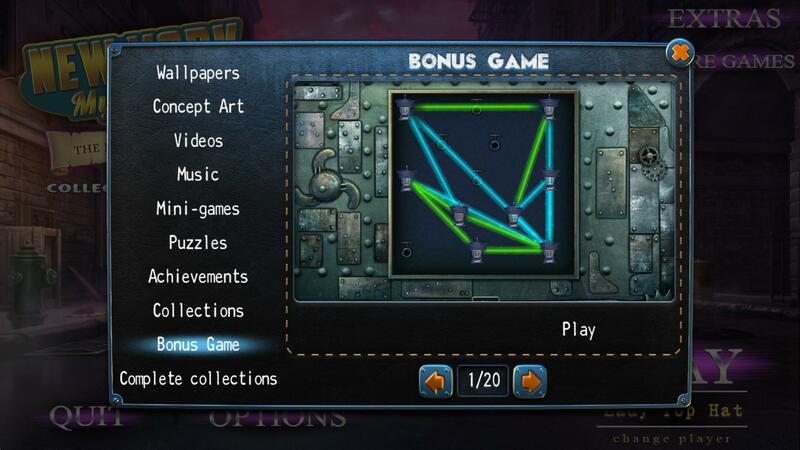 There are twenty Lamp beam puzzles to complete under the heading Bonus Game. This is a bit counter-intuitive considering that the achievement wording is to complete all mini-games in the Extras Menu.